If you love to fish, you should know that the Myrtle Beach area is home to some of the best fishing along the East Coast. When you stay in our North Myrtle Beach vacation rentals you’ll be near one of the most abundant fishing sources in the region – the historical Cherry Grove Fishing Pier, a favorite spot for locals and visitors alike. Cherry Grove Beach is located on the north end of North Myrtle Beach. 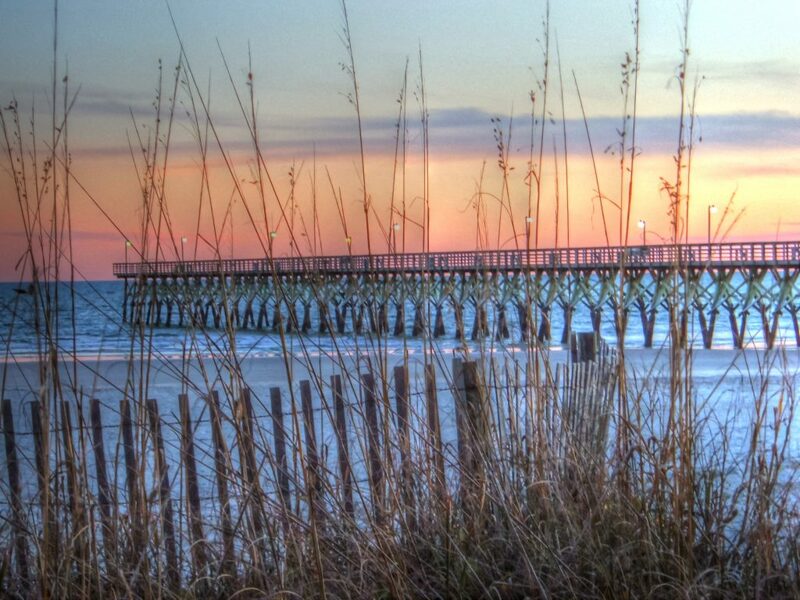 The Cherry Grove Pier is located at 3500 North Ocean Blvd in North Myrtle Beach’s scenic Cherry Grove area. Pier parking is available, for a small fee, just north of the pier or in the public parking area on the 7th and 8th floors of the tower two parking garage across the street. Built in the early 1950s, the Cherry Grove Pier extends 985 feet out into the Atlantic Ocean. Pier hours change seasonally, operating Sunday through Thursday from 6AM to midnight, and Friday and Saturday 6AM to 2AM during the summer peak. Please call 843-249-1625 for current hours of operation. Make sure to visit the Boardwalk Beach Cafe at the head of the pier. The cafe offers seating indoors or outdoors, with oceanfront views, to partake in affordable eats, cold drinks, and daily happy hour specials. Boardwalk Beach Cafe is open each day from 11AM to 9PM, but the tiki bar is open until midnight. All visitors must purchase an arm band to access the pier. The “Walkers Pass” is just $3.00. Fishing prices vary (see below). The Cherry Grove Pier is widely held to be the site of some of the best fishing and remarkable horizons in the Carolinas. The fishing season is nearly year-round, extending from the beginning of February through the beginning of December. Anglers of all ages and skill levels are welcome to cast a line to lure the diverse species that flock to the region’s warm waters. Among the species known to call the area home are Bluefish, Pompano, Specs, Sheepshead, Spots, Whiting, Red Drum, Sea Trout, Blue Crab, Summer Flounder, King Mackerel and Spanish Mackerel, Gray Trout, Weakfish, Spadefish, and Angelfish. The on-site bait shop rents quality gear from trusted brands including Diawia, Shakespeare and Sea Striker. All-day rod rentals are $24.00 (with a $30 deposit), and $16.00 for half-day use after 3PM. Save on costs by bringing your own rod, and purchasing a one-day fishing pass for just $3.00 admission and $7.50 per rod. An assortment of bait such as mullet, shrimp, squid, live and artificial blood worms are available for purchase. Crab fishing is also a popular activity at the pier. The bait shop carries crab bait and nets for sale. Your pier admission allows you to fish from the pier without obtaining a saltwater fishing license! 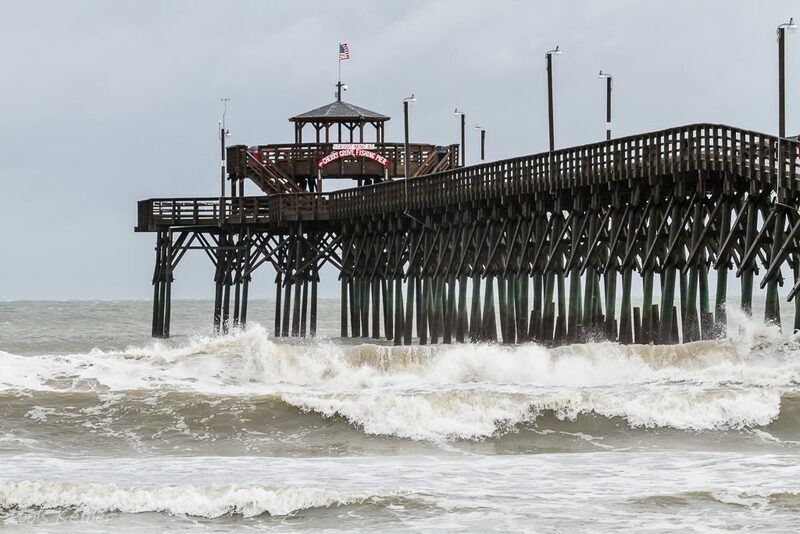 Over the course of its storied history, the Cherry Grove Pier has achieved notable distinctions, not the least of which is its resilience against the forces of Mother Nature. Purchased by the Prince Family in 1965, the pier pre-dates North Myrtle Beach itself, which was officially formed by the union of Cherry Grove Beach, Windy Hill Beach, Crescent Beach, and Ocean Drive Beach in 1968. In 1989, the pier was destroyed by the wrath of Hurricane Hugo, but it came back stronger as it was rebuilt to include the only two-story observation deck at any privately-owned pier in the Myrtle Beach area. Ten years later, Hurricane Floyd challenged the pier, causing extensive damage to the observation deck, which was rebuilt in time to greet the next round of summer guests. In 2001, additional renovations widened pier access and updated the bait shop. The Cherry Grove Pier carved a notable place in fishing history in 1964 as the site of a record catch by Walter Maxwell, who managed to reel in a 1,780-pound tiger shark. To date, this it the only all-tackle world record documented in South Carolina! The Cherry Beach Fishing Pier offers a full-day of beach-side fun for the whole family, and every convenience to avoid stress and pave the way to a peaceful experience. You don’t have to be an angler to enjoy the area – even though it helps! Cherry Grove Beach is one of the most scenic, and least crowded beaches in North Myrtle Beach. Relax on the sand as you soak up the sun’s rays. Stroll the shoreline letting the waves crash against your feet. Gather the whole family to build the ultimate sand castle. There’s no wrong way to enjoy paradise! The pier’s bait shop carries all the essentials, such as soft drinks and ice-cold beer, beach apparel and accessories – not to mention, the great souvenirs!